This enchanting tale of dragons, betrayals, and the power of friendship is the first in a charming and thrilling series by New York Times bestselling author Jessica Day George. Creel can't believe her aunt wants to sacrifice her to the local dragon. It's a ploy to lure a heroic knight so that he will fight the dragon, marry Creel out of chivalrous obligation, and lift the entire family out of poverty. Creel isn't worried. After all, nobody has seen a dragon in centuries. But when the beast actually appears, Creel not only bargains with him for her life, she also ends up with a rare bit of treasure from his hoard: a pair of simple blue slippers, or so she thinks. 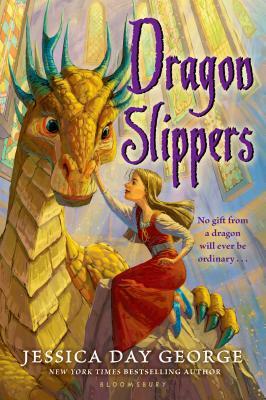 But Creel learns that these shoes could be used to save her kingdom from the brink of war--or destroy it.